There are apple trees all over Lopez: tidy, pruned ones in home gardens and commercial orchards; overgrown old standards visible across open fields, reminders of the island’s original orchards; heavily fruited but abandoned specimens along roadsides. Curiosity over one of these nameless roadside trees—a beautiful old standard along Davis Bay Road, always loaded with big apples this time of year—led me to Romayne and Mary Ritchie and Eric Hall and their explanation for all these apple trees. People plant apple trees for food and for pleasure. “Every place we’ve ever lived, we’ve had to plant an orchard,” Mary added as we admired the trees stretching in rows south of the house and in espaliers north and east of it. As she identified varieties, we repeated the names: Summer Rambeau, Gravenstein, Yellow Transparent, Blushing Golden, King, Wagner, 20-Ounce, Idared. Though a recent stroke has left Romayne unable to talk, he knows the locations of all the varieties he’s planted over the years and took us to any variety we wanted to see. 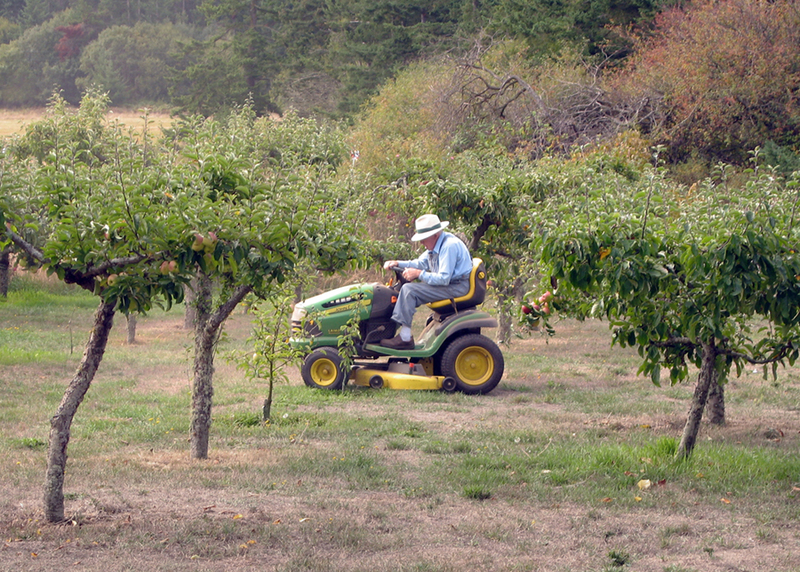 Then, leaving us to talk about grafting and budding and to compare the flavors of all these apples, he got on his mower to cut the grass growing up between the trees. Talking with these apple enthusiasts, I realized that with all our focus on local, organic, sustainable agriculture, it’s easy to lose sight of the pure pleasure of growing food. In the end, it’s that pleasure that keeps us planting things. And that nameless roadside tree? Mary told me it’s a Blue Pearmain.